Being and insurance agent that focuses on breweries and other craft beer related risks I spend a lot of time drinking local beer. Recently Bryan Roth from This is why im drunk asked me to participate in a series highlighting six beers from Maine. Bryan is recruiting beer bloggers from across the country to write blog posts about a specific state and include six beers others should try. They all have to be available in bottles or cans, no growlers and also should not be limited release beers. We have so much great beer in Maine I knew picking six would not be easy but here they are in no particular order. Most craft beer drinkers outside the State of Maine seek out Maine Beer Company’s Lunch as it is the most popular beer from MBC and is an excellent IPA. However Mo should not be overlooked. This is a hoppy pale ale and is much easier to find than lunch. As you can see from the photo the beer has a great thick white head. Aroma has more pine and citrus than many IPAs and the taste does not disappoint. Malty start but the hops quickly take over. MO is named for the brewers twin daughters; Madeline and Oliver. If you make it to Maine be sure to check out Maine Beer’s new facility in Freeport as it has a great tasting room and plenty of fresh beer. 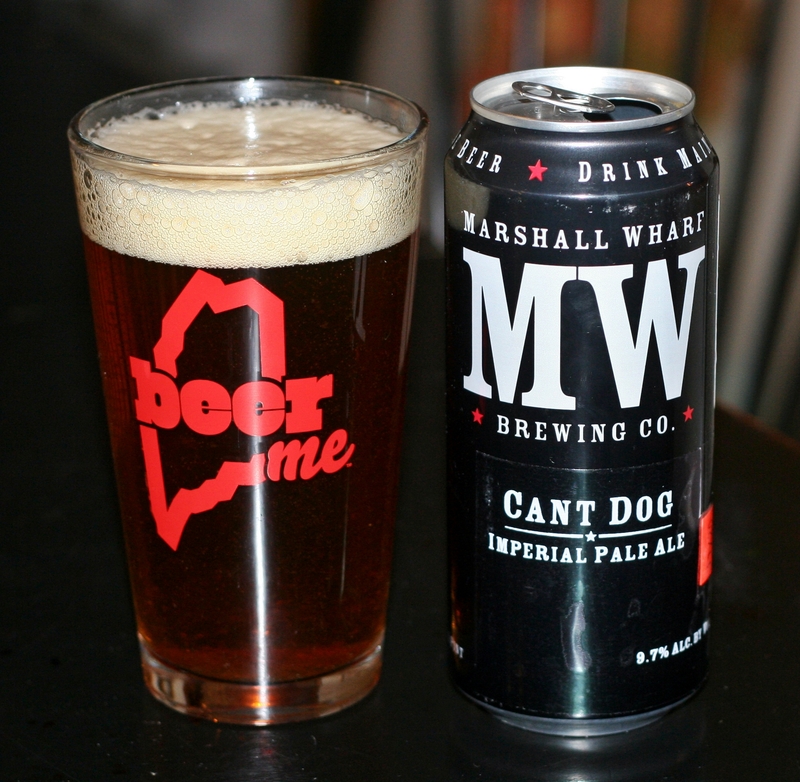 Marshall Wharf only recently started making cans and the first beer they decided to can is their huge imperial IPA, Cant Dog. This beer is big with their website claiming it is 10% ABV. 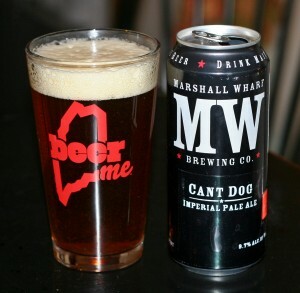 I drink a lot of imperial IPAs and I can honestly say none of them hit harder than Cant Dog. In addition to it being a big beer it comes in a big can – 16 ounces of pure hop pleasure. This beer is darker than most IPAs with a nice tan off white head. Aromas are pungent with pine, citrus and grassy hops. The flavor is fairly well balanced but still extremely hoppy. There is a big malt backbone. Finish leaves the filmy residue that big IPAs often do. Marshall Wharf makes some great beer and they do an exceptional job hiding the alcohol in their beer. Most people that visit Maine enjoy the coast and if you are planning a trip to the Mid-coast region be sure to include a stop at Marshall Wharf. 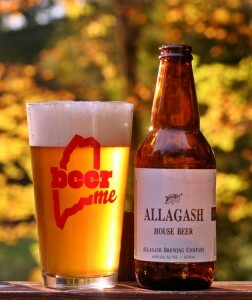 Any list of beer from Maine would not be complete without something from Allagash. They make so many exceptional beers it was hard to choose only one for this list. Many of the beers by Allagash are available outside the State of Maine so I decided to include one of the few that is only available by visiting the brewery in Portland Maine. House Beer is a Belgian Pale Ale sold only by the case and only at the brewery. This beer is fairly simple when compared to Confluence, Odyssey or any of the other beers that Allagash makes but this was intentional. Their goal with House Beer was to have a “table” beer similar to a house wine that you can enjoy with any meal. This beer comes in at 4.5% ABV, has a great color and taste is simple but has a decent amount of hop and spice from the Belgian yeast. Allagash makes great beer and just went through a significant exp ansion. They provide one of the best brewery tours I have taken and it is well worth the visit if you come to Maine. This is a new beer from Sebago Brewing Company, I beleive it replaces their brown which has been in their line up for a long time. It is described as a hoppy rye ale which sounds similar to Daymark from Rising Tide above but these beers are entirely differenct. Bonfire Rye starts of with plenty of malt followed by some nice hop flavor then a hint of rye and smoke. If it sounds like there is a lot going on you are correct but it works well. This is a nice fall beer without the pumpkin or spice you get from so many other brewers. 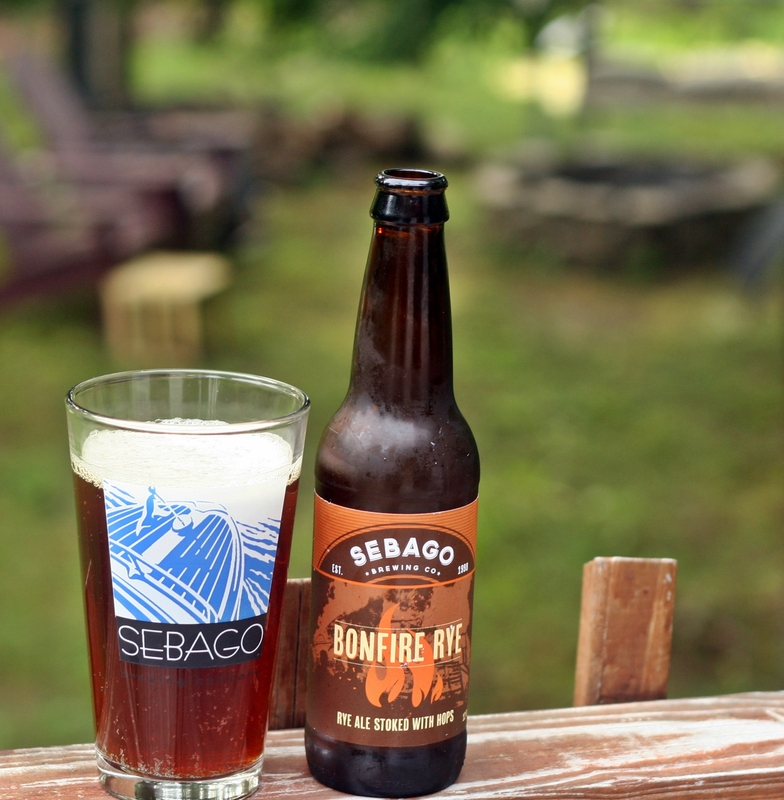 Sebago has 4 brew pubs in Maine and their beer is available in most retail outlets. It would be hard not to find their beer if you are looking for it in Maine. 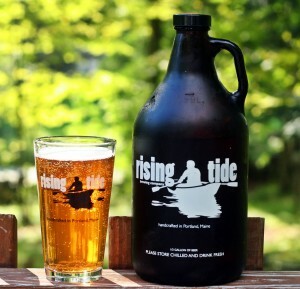 Rising Tide has not been around as long as Allagash or Maine Beer Company but in they are producing a lot of great beer from their new location on Fox Street in Portland. The picture here is of a growler of Daymark but this is one of their core beers sold in 22 ounce bombers. Daymark is a rye beer with a solid Columbus and Centennial hop bill. The beer is very light and refreshing with a fair amount of floral hops in the aroma. Some peppery spice from the rye but everything is very well balanced. The brewery has regular hours, sells growlers, bottles and other merchandise. They also have a solid schedule of food trucks and usually have corn hole to keep you entertained while having some samples. For my sixth and final beer I had so many options including some very good options from Gritty’s, Geary’s and many other great breweries. 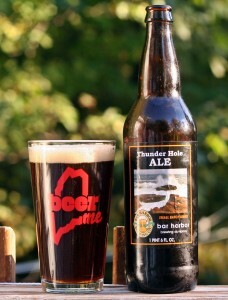 I opted for this one from Bar Harbor Brewing as it is one of the better brown ales I have tried. Bar Harbor Brewing is actually part of Atlantic Brewing but still operates under the Bar Harbor label. This is a straight up English style brown ale with a nice deep brown color and tan head. Aroma has the nutty sweetness you expect and the taste has lots of caramel malts. An excellent brown ale worth trying plus it is named after one of the more famous areas of the coast, a visit to Thunder Hole in Acadia National Park is a must. Well that is my list of six beers from Maine as of August 2013. If I were to do this again in 2014 it may be entirely different as we have a number of breweries opening soon including Tod Mott’s new brewery in Kittery, Banded Horn Brewing in Biddeford which is owned by Ian McConnell former brewer at Sixpoint in New York as well as Bissell Brothers Brewing and Foundation Brewing opening on the same road as Allagash in Portland. So much is happening in Maine’s craft beer scene it is a great time to visit our wonderful state. Seems like a lot of breweries are offering single hop varieties of their pale ales and IPAs. Fortunately the ones that are doing it are doing it well. The list includes, Portsmouth Brewery with their Project X series, Blue Lobster with their Excess is not Rebellion series and Hill Farmstead is doing a number of pale ales. Nelson Sauvin is a hop from New Zealand that is gaining popularity in the US. The coloring is very similar to Edward the flagship pale ale from Hill Farmstead and it just looks great in the Hill Farmstead glass. Aroma has a nice pineapple and other tropical fruit smell. Taste follows with plenty of hop goodness and just enough of a malt bill to keep things balanced. This beer is very refreshing, easy to drink and is truly enjoyable as most Hill Farmstead beers are. Brewers Description: An American Pale Ale bittered, flavored, and dry hopped exclusively with Nelson Sauvin. 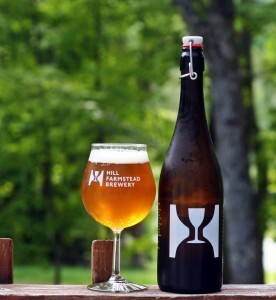 Grassroots is the name used for beer brewed by Hill Farmstead when collaborating with another brewery. Shadow Pictures of a Journey happened because brewers from Denmark were in the area for The Festival in Portland Maine. We were so lucky to have so many talented brewers in the area. This beer is very similar to other double IPAs brewed at Hill Farmstead but maybe just a bit darker and the carbonation seemed a little lighter. The aroma was big and excellent with lots of citrus and a bit of pine. Taste was exceptional with loads of hops but also very smooth and easy to drink for an 8% ABV beer. Overall this is one of my favorites from Hill Farmstead, right up with Society & Solitude #5. 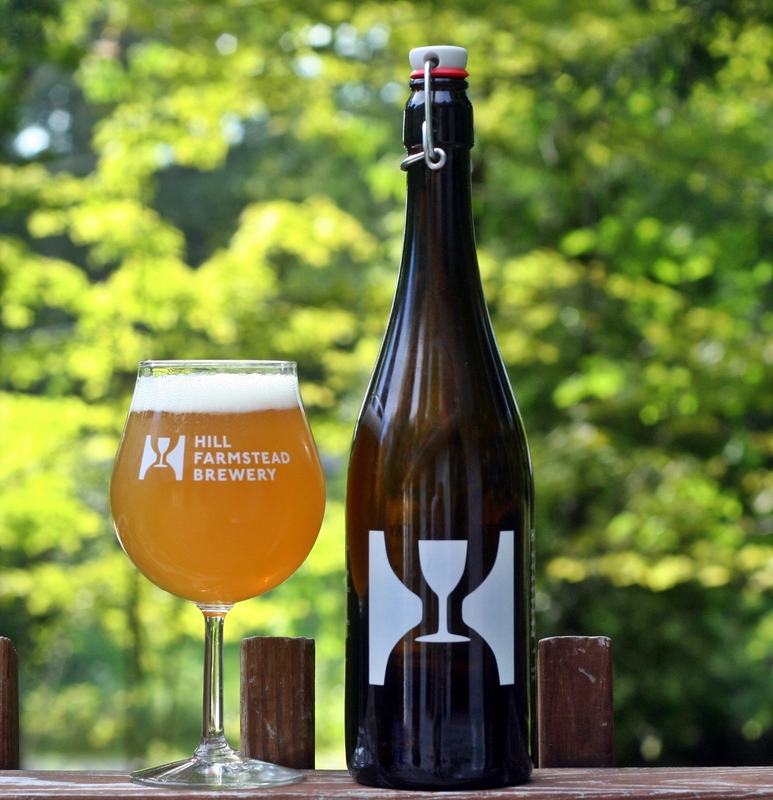 Brewers Description: This double IPA is a collaborative beer brewed by Shaun E. Hill of Hill Farmstead Brewery with Jacob Storm and Morten Lundsbak of Amager Bryghus (Denmark) at Hill Farmstead Brewery in Greensboro Bend, VT. 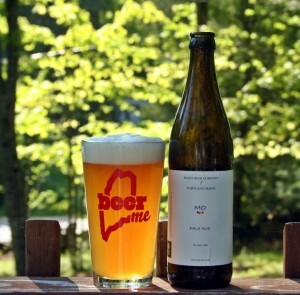 The name is inspired by one of Danish writer Hans Christian Anderson’s travelogues; the beer represents a vivid but fleeting memory of a productive and wonderful visit by our Danish friends to Vermont’s Northeast Kingdom. 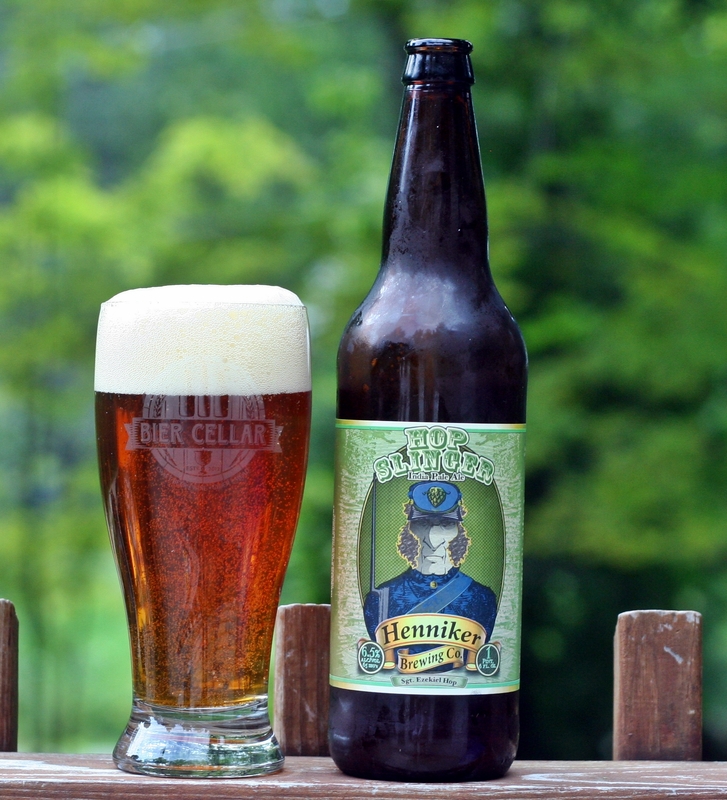 This is the second beer from Henniker brewing – Hop Slinger IPA. Henniker is only available in New Hampshire at beverage stores throughout the State and at select restaurants, bars and at the brewery. I had high hopes for this beer being a fairly local IPA at a reasonable price point but unfortunately I found a completely average IPA. Appearance may be the best part of this beer with a deep copper color and thick off white head. Aroma has some pine hops but also more malt than I expect in an IPA. Taste follows with a mild hop presence and plenty of malt, seems like they were going for a well balanced IPA and just overdid it on the malt. Overall this is not a bad beer but not something that I would seek out again and in a market with lots of IPAs you really need to stand out to catch my attention. Brewers Description: An India Pale Ale – gets its golden copper color from the light caramel malts, which provide a solid backbone to the support all the great hops. This beer presents with an overwhelming citrus aroma that leads into an unmistakable flavor of grapefruit. Hop Slinger leaves you with a nice dry bitterness that pairs well with spicy curries, salty fried foods and ginger based desserts. In late June The Festival came to Portland Maine bringing in many talented brewers from Europe. While they were here many of them took the time to do some collaborative brews with local breweries including this one from Maine Beer Company and Nogne-O. I drink mostly American beer so I am not all that familiar with Nogne-O. This collaboration is a saison not the usual hop forward pales and IPAs that Maine Beer is known for. It pours a beautiful orange with a perfect white head. Aroma has plenty of rye spice and is very pleasant. Taste is balanced and a bit hoppier than most saisons but still seems fairly simple. Collaboration Time III is an easy to drink beer and would pair well with most meals. Brewers Description: Brewed with a new friend, Kjetil Jikiun, founder and brewer at Nogne-O. Our aim was to brew a delicate, sessionable beer incorporating elements of the saison and hoppy American ale styles. We used a blend of our house ale and saison yeast strains. The result, an ale, golden in color, generously hopped, with background notes of saison funk accented by soft rye and wheat flavors. 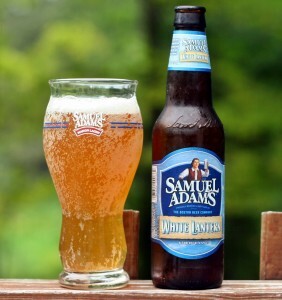 Both Samuel Adams White Lantern and Allagash White say on the label “beer brewed with spices” but that is where the similarities end. While Allagash White is flavorful, pleasant and enjoyable with just about any meal, White Lantern is nearly flavorless and ended up going down the drain before I was even half way through the beer. The appearance is not all that bad but it seems too clear for a witbier. Aroma had a little orange peel but that is about it and even that went away in the flavor leaving a very bland beer with the only noticeable flavor being a bit of wheat. This beer might appeal to a Blue Moon drinker but if you are used to drinking Allagash this beer will disappoint. Brewers Description: White ales have a long history of unique ingredients, as Belgian brewers experimented with spices discovered during the spice trade. For our hazy brew we created a refreshing combination of crisp wheat, the tangy sweetness of tangerine & orange peel, and the subtle spiciness of coriander & Grains of Paradise. I’m a bit late getting this review up but if you look hard you might be able to find some of this seasonal beer still on the shelves. 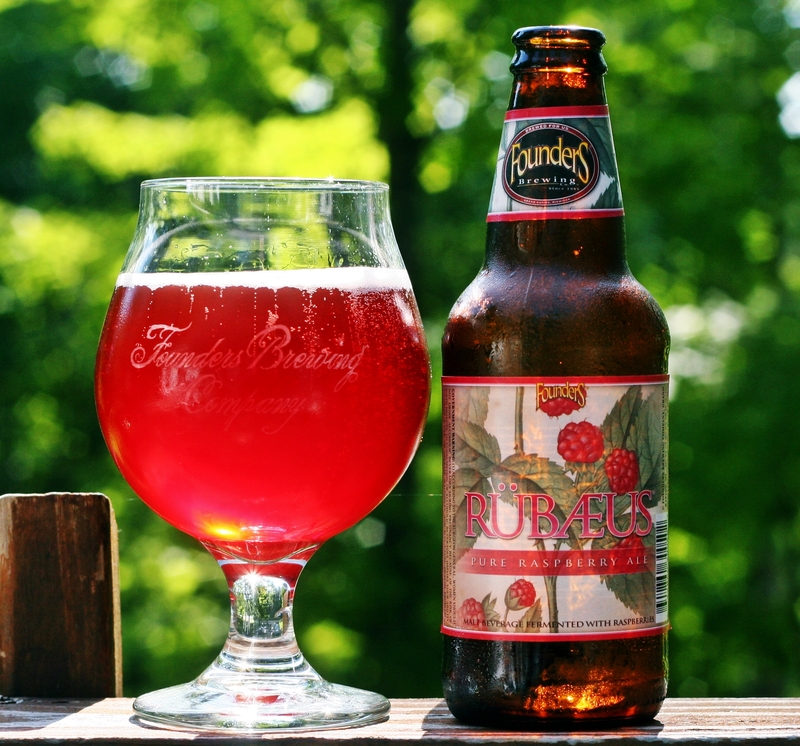 Rübæus is a raspberry beer and I am typically not a fan of fruit beers but Founders did a nice job with this one. The color is amazing and the picture captures it quite well – a bright red with minimal head. Smell has tons of raspberry and is very sweet. Fortunately the taste keeps the raspberry but loses most of the sweetness. No doubt this beer is sweeter than your average beer but it is not the syrupy sweet you often get with fruit beer. Overall I really enjoyed this beer but I am not sure I could drink more than one on any given evening. Something to try but certainly not going to be an everyday beer. Brewers Description: Not another boring summer wheat beer or lemonade shandy—Rübæus is Founders’ way to celebrate the season’s warmest months. Optimizing the flavor of fresh raspberries added at multiple stages during fermentation, this stunning berry red masterpiece is the perfect balance of sweet and tart. No question about it, with a hefty malt bill and 5.7% ABV, this beer is 100% Founders. 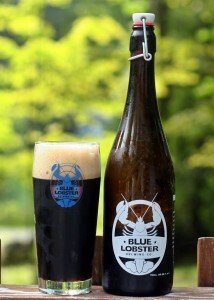 After drinking the black IPA from Blue Lobster I had to go back to my favorite style – the double IPA. This is the third installment of their Excess is not Rebellion series of double IPAs, this one using only Columbus hops. This beer could be summed up in one word – dank! Because I like to type I will give you a little more detail. Color is a very nice orange with a small head that left a fair amount of lacing on the glass. Lots of aroma from this beer with citrus and tropical fruits – very pleasant. Taste is surprising for a single hop beer a lot of different things happening. Certainly lots of same citrus, tropical hop flavor but you also get a nice bitterness and the oily resin remnants that I like in my DIPAs. I liked this one better than the Galaxy edition but probably not quite as well as the original which used a blend of 3 hop varieties; Galaxy, Centennial and Citra. 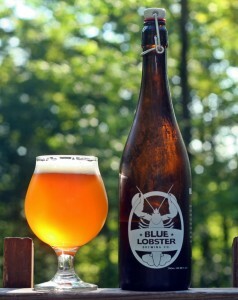 Hopefully Blue Lobster continues to experiment with single hop DIPAs as this was fantastic. Blue Lobster is making some great beer in Hampton, NH and if you enjoy craft beer you need to make the trip. When checking out their Facebook page I saw David’s version of a black IPA was on and had to try it as this is a style that I still have not accepted. Color is not surprising, black with a nice thick tan head. Aroma has plenty of the roasted malts you expect from a black IPA but also a fair amount of piney hops. Taste is where most black IPAs lose me and this one is no different. The huge amounts of roasted malts and just a hint of hops if you really look for them. Bitterness is where it should be for an IPA but I still get lost in all the malts. Don’t get me wrong this is a good beer and one of the better black IPAs I have had but I simply don’t get this style. If you enjoy black IPAs you will enjoy this beer. If you have been to Rising Tide in recent weeks you have probably met Calypso, Nathan and Heather’s new puppy. They decided to brew a beer for the new puppy and made it a very sessionable saison at 3.5% ABV. Seems like everyone is making saisons now when just a few years ago they were almost non-existent. I have found this to be a good thing as I really enjoy the style and there is so much that can be done with them. Color is a nice pale orange with only a whisp of a head. Aroma is minimal but some earthy yeast comes through. Taste has a bit of spice with a nice dry finish that leaves you wanting more. 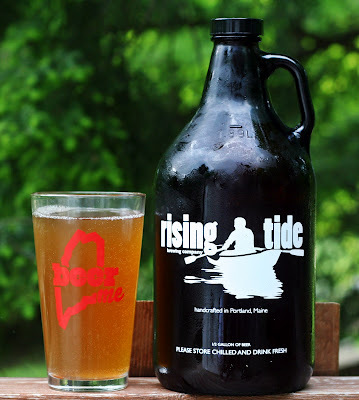 Overall this is a simple but tasty saison from Rising Tide and something I hope they bring back next summer as it truly is a session beer worthy of a 64 ounce growler. Brewers Description: 3.5% abv saison brewed with 100% calypso hops.